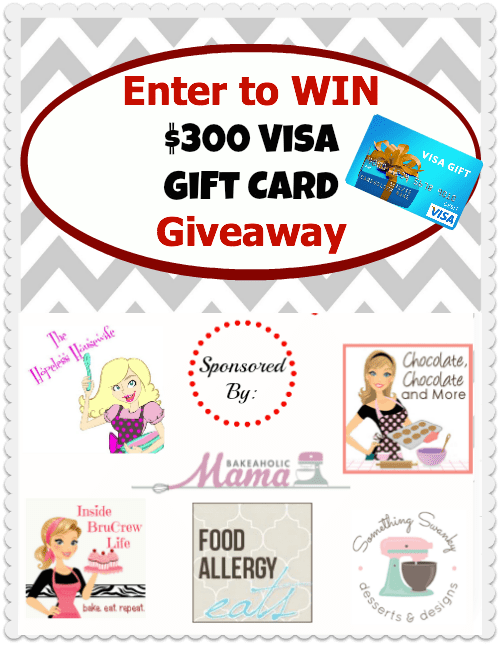 Visa Gift Card Giveaway - Chocolate Chocolate and More! Sometimes the best way to start off a Monday is with an easy Giveaway! Just follow the Rafflecopter widget to enter! Chocolate, Chocolate and More has become my favorite blog. My Pinterest boards reflect it, too. Thank you for all the wonderful recipes. Thank you so much for the great giveaway! Hope you had a wonderful weekend and happy Monday! I don’t yet have instagram capability but maybe soon, with help of a Visa gift card. Not sure if I have signed up to bloglovin correctly for Brucrew, but I have used her recipes in the past and would definitly want to follow her!